"In life we loved you dearly. In death we love you still. In our hearts you hold a place no one could ever fill." Stempy was born on July 17, 1997 in Wylie, Texas. He was, by far, the smallest in his litter. 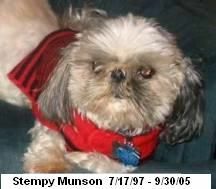 Size-wise, Stempy was an “Imperial” Shih Tzu. Many people often remarked that he was the smallest Shih Tzu they had ever seen. Stempy’s sire was an AKC Champion…..CH Karyon Del La Rosa’s Wonder. Stempy’s breeder was Linda Council. We (Cindy & Greg) had only been together a few months when we decided we wanted another doggie. 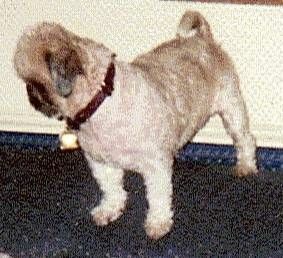 Greg already had Muffy, a 9 year old female Lhasa Apso, who, at that time, we thought was a Shih Tzu. It was later, after we had Stempy for a year or two, that we figured out that Muffy was actually a Lhasa Apso….her breeder raised both. Since we thought Muffy was a Shih Tzu, we decided to look for a little boy Shih Tzu. We looked at the classified ads in the newspaper. Who would have known that we would be lucky enough to find an AKC champion sired Shih Tzu in the newspaper?! We were extremely lucky to have found Stempy in the newspaper. We bought Stempy in October 1997 when he was 12 weeks old. 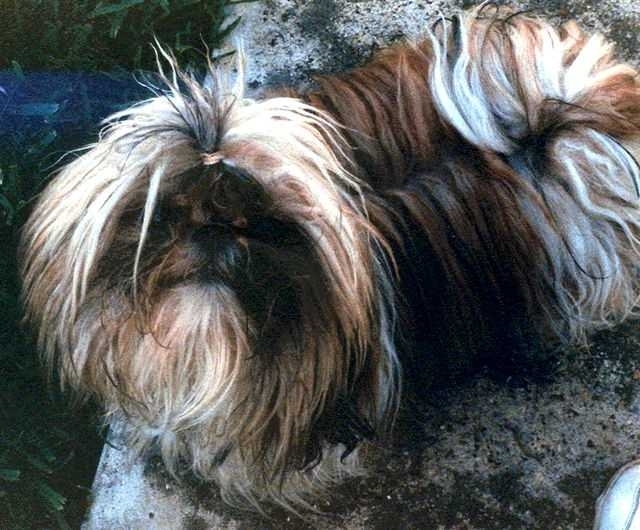 When we went to pick out a Shih Tzu, Linda Council had bathed and brushed all of Stempy’s bigger brothers and sisters. He was in a kennel with a bigger brother who was trampling all over him. Stempy immediately caught our eye. Linda couldn’t believe we were interested in him. After all, he wasn’t yet groomed and was so tiny. It was love at first sight! As soon as Stempy was out of the kennel, he came right up to us with his little tail wagging. There was no question that he was the one for us! Stempy symbolized us. We met July 13, 1997 and Stempy was born July 17, 1997. We had basically had him the whole time we have been together. Right from the start, we knew this little boy was special. He was so smart that he learned to climb the stairs at our apartment after only a few tries. Next thing we knew, he was zipping up and down the stairs with ease. He would always stop at the bottom or top of the stairs and wait for us and snort at us, as if to say, “Come on, Mommy and Daddy! What’s taking you so long?” When we moved into our house in 1998, we think he missed the fun of running up and down the stairs. Stempy had to know that he was from an extensive line of show champions. While he was too small to show, you couldn’t have told him that. He thought he could and should be able to do anything bigger dogs were able to do. He carried himself like a champion. He was so proud and had the perfect little show dog prance. If he had been bigger, we have no doubt that he would have knocked them dead in the show ring. He had the “look,” the “prance,” and, most of all, the personality of a champion. One look with those big eyes and he would just melt your heart. Everyone that met him absolutely adored him. How could you not? His eyes always said, “Love me, hug me, squeeze me,”…and we were happy to oblige! We do not have any kids. Our dogs are our kids. After we moved into our house, our number of doggies grew. Stempy had grown real attached to Muffy. The year was 1999 and Muffy was now 11 and Stempy was 2. Since Muffy was getting on up there in years, we thought we better get Stempy another friend. Since we were so thrilled with Stempy, we thought we would purchase another Shih Tzu from Linda Council. As hard as we tried, we were unable to get in touch with Linda. (Just recently, after Stempy passed away, we learned from another breeder that Linda had sadly passed away several years ago.) We went back to the newspaper to find Renay, our female Shih Tzu. Renay and Stempy became the best of friends and partners in crime. As Muffy got older, she ceded authority of the doggie pack to Stempy. Stempy soon became his “Daddy’s ‘Lil Deputy,” making sure the other doggies did not get out of line. Over the years, Stempy had grown really attached to his Daddy and was his constant shadow. In the car, Stempy insisted on riding on his Daddy’s shoulders so he could see everything. Yes, he was very spoiled. Stempy was practically human. He slept above our heads in the bed. He could read our moods and always knew just what to do to cheer us up, if need be. He was also a little stinker. He would come up and scratch you on your leg to get your attention. Then, when you would reach down to pet him, he would back away from you where you couldn’t reach him, as if to say, “Haha! You wish you could pet me! But you can’t reach me!” Then he would snort at you to taunt you. If he felt like we were not paying him enough attention, he would turn mischievous and do something he wasn’t supposed to just because he knew that would get our attention. If we were wrapping presents, he would come and lay down on the wrapping paper, as if to say, “Hey! Look at me! I’m your present! Play with me and scratch my belly!” He was hilarious! We loved him so much! 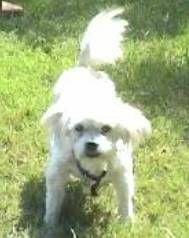 Around 1999, Stempy had his first experience with bladder stones. He did not need surgery, as the vet at the time flushed the stone back to the bladder and he was put on a special diet to dissolve the stone and another diet to prevent a recurrence. We religiously bought and fed Stempy his prescription diet for the rest of his life. 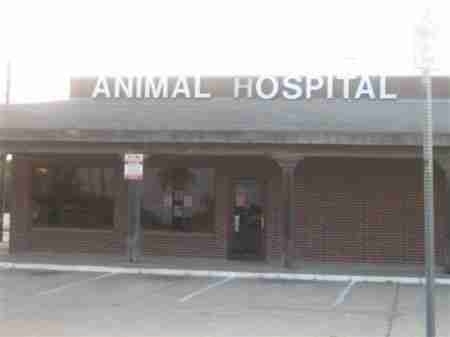 We had never really had any problems at that vet clinic (we should have kept using them), but our doggies never saw the same vet twice there. It was always someone different. We felt, at the time, that it would be best to find a clinic where the doggies would always see the same vet so that the vet would get to know our doggies. It was the Fall of 2003 when we made the worst decision of our lives. 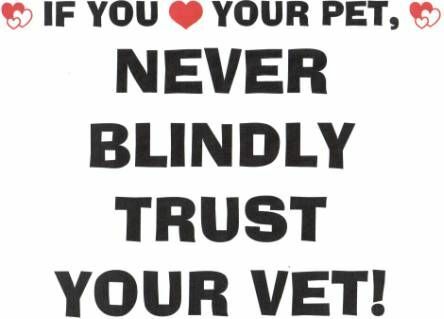 We decided to change vets and chose Ann K. Thomas, DVM as the doggies new vet. You can read the Timeline and the rest of the website to find out about the substandard care and negligence that Stempy endured at the hands of Dr. Thomas over the last two years of his life. We trusted her. She betrayed our trust and now our beloved Stempy is gone forever. This website is here to tell what happened to our little boy and to help advance our efforts to exact justice for his unnecessary and preventable death. We will never forget Stempy. He was truly a once in a lifetime dog that was taken from us much too soon. Stempy Munson. July 17, 1997 – September 30, 2005. The following letter was sent to author Lynda Austin in September 2006. 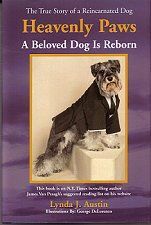 Lynda wrote a book titled, “Heavenly Paws: A Beloved Dog is Reborn.” The book is about the reincarnation of her dog , Maxwell. Her book gives me hope that one day Stempy will return to us. - Greg Munson. Here is the story of our hunt for Stempy….. I have been desperately searching for Stempy reincarnated ever since he passed away 9/30/05. 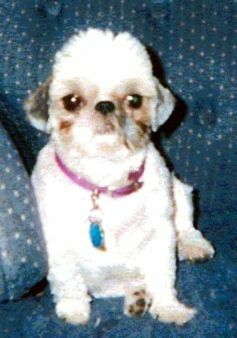 Back in 1999, we decided we wanted a female Shih Tzu and we wanted to get a Shih Tzu from the same breeder, since we were so thrilled with Stempy. As hard as we tried, we were unable to locate his breeder (Her phone numbers no longer worked.) We ended up getting Renay, who is now 7 years old, from a different breeder. She ended up being Stempy’s best buddy. I had not searched for his breeder again until last year. I do not know what possessed me to do so, as we were not looking for another dog, but a few months before Stempy passed away I started the search again. 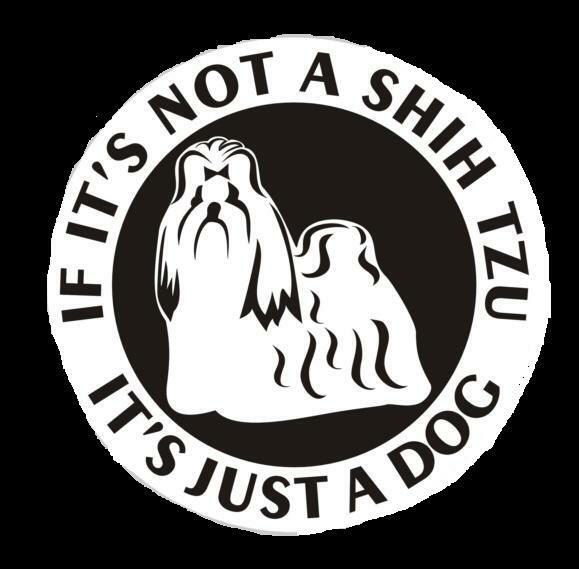 I did know that one day I would want another Shih Tzu from his bloodlines, because of just how special he was, but I did not think that it would be for several more years. I started my search on the Internet by typing in the breeders name into Google. This search lead me to some show results on the website of a Maltese breeder/handler. This person had shown dogs previously for a show breeder with the same name as Stempy’s breeder. I emailed her and inquired if it could possibly be the same person. She emailed me back to let me know that it was indeed the same person, but sadly, she had passed away several years prior. She let me know that all of the dogs went back to the breeder’s mentor. 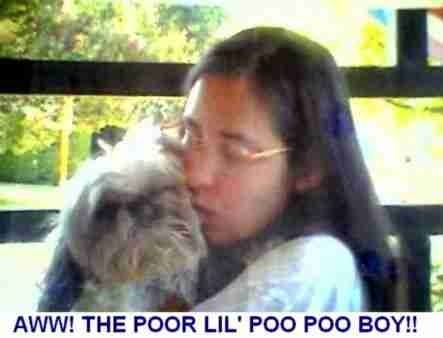 Her name is Pat Fletcher of Karyon Shih Tzu and I was given her email address. I contacted Ms. Fletcher to inquire about the dogs that Stempy was from. She no longer had any of the dogs from Stempy’s breeder, but as those dogs were originally purchased from her, she had the bloodlines. She asked me when would we be interested in a pup. I told her that it would probably be a few years as Stempy had just turned 8 years old. We wanted to find and keep track of his bloodlines for the future. Little did I know, at the time, that Stempy would be gone barely a month later. Stempy was a little bitty boy. His optimum adult weight was about 5 or 6 lbs. He was the smallest in his litter by far. The breed standard calls for an adult size of 9 to 16 lbs. The small ones are rare and occur naturally and they are not necessarily runts. Show breeders do not have them very often because they are breeding for the standard size. The smaller ones seem to run in certain bloodlines. There are breeders now that breed exclusively for the smaller ones. The smaller ones are now known as Imperial Shih Tzu. There is quite a bit of controversy between these breeders and show breeders as show breeders think that breeding exclusively for the smaller ones will destroy the breed. The smaller ones cannot be shown because of their size. I disagree that breeding exclusively for the smaller ones will destroy the breed. I believe that the standard needs to be revised. The Shih Tzu used to be, on average, a much smaller dog than today’s 14 & 15 lb. champions. The empress in China used to carry this dog around in her sleeve. 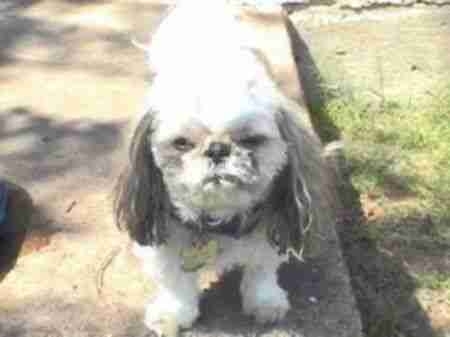 The Shih Tzu then would have had to have been about the same size as Stempy. I most certainly believe that Stempy will return as a male Shih Tzu and I really believe that he will be a tiny imperial boy again. His size was so much a part of who he was. He slept on the pillow above my head in bed. He insisted on riding behind my head on my shoulders in the car so he could see what was going on. He was such a proud and happy little boy. You could tell by the way he carried himself that he was descended from champions. He had such a great personality, that had he been allowed to compete in the show ring, he would have wrapped the judges right around his little paw. He had the perfect little show dog prance and it was as if he glided across the floor. Many people often remarked that he was the smallest Shih Tzu they had ever seen. Everyone who met him fell in love with him. His eyes would just melt your heart. Many people wanted to take our beloved Stempy home with them. Of course, they were teasing, as they knew we would never let that happen. 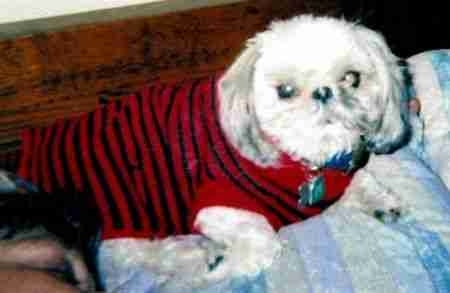 I believe in my heart that if he returns, he will return again as a little bitty Shih Tzu that everyone fawns over. 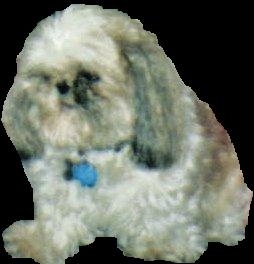 Muffy, our 17 ¾ year old female Lhasa Apso, passed away 10 days after Stempy due to old age and cancer. Those were some pretty rough times for us. We had been preparing ourselves for Muffy’s loss. We certainly had no idea that we would lose Stempy. The analogy I often use is that losing him was like getting hit in the face with a bat. We truly feel that Muffy held on for those 10 days after Stempy died because of our extreme grief. One day, I noticed she was going downhill really fast. I went and picked her up and held her close. I told her how much we loved her and what a great companion she had been for so many years. I told her that, although we would surely miss her deeply, we would be ok. She did not have to stay around for us any longer. I told her she could go ahead and go be with Stempy and for them to take care of each other. We loved them both deeply. Muffy passed away that night. She is also dearly missed, but at least she did get to live a long life for a doggie. I’ve had many dogs in my life. Not to take anything away from any of them, but those two were the best I’ve ever had. They are buried next to each other on the side of our house. Both were buried in sealed Rubbermaid containers with their sweaters, pillows, toys, and other personal effects of both theirs and ours. We kept both of their collars and id tags. Cindy cut a few locks of Stempy’s fur. We still have those things. After Muffy and Stempy passed away, we were so grief stricken we knew we needed some new pups to love to help us cope. In late October, we bought Echo (Muffy’s Echo), a Lhasa Apso. She was born 8/12/05 and just recently turned 1 year old. She is a real sweety and looks a lot like Muffy. We also contacted Pat Fletcher again, of Karyon Shih Tzu. Needless to say, she was surprised to hear from us so soon and saddened by our loss. As she is a show breeder, she did not think she had a “little one” at the moment. We were prepared to wait. I think she sensed our extreme grief and a week or so before Thanksgiving, she called us. She said she did have one little boy who was going to stay little. She said he had already been spoken for, but that she talked to the people and they agreed to choose a different pup. We were thankful and we went and bought Ditto (Stempy’s Ditto). He was born 8/08/05 and also just recently turned one year old. He is closely related to Stempy (first cousins, once removed – see attached pedigrees). He did stay small…he is about 7 lbs at a year old….but he is a little taller and longer than Stempy was. We can tell by the personality that they are from the same bloodlines. We certainly love Ditto very much, but he couldn’t be Stempy because he was born before Stempy passed away. We had never really been ones to believe in reincarnation before Stempy passed away. The pain of losing him was (and continues to be) so severe, it made us consider things we had never really thought about before. I read a little bit about animal reincarnation on the Internet. I immediately started searching for a little boy born 9/30/05….which is the day Stempy died. 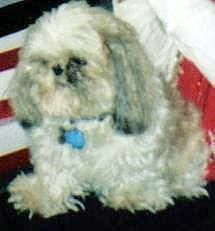 I have literally looked at thousands of Shih Tzu on www.puppyfind.com since Stempy passed away. We love our new little pups, but still had a desperate longing for Stempy. After a little more research on reincarnation, I accepted that he most likely would not return instantaneously. The desperate search continued. I searched show breeders all over the US. I thought about contacting an animal communicator, but still have not done so. Besides being tiny, Stempy had some other distinguishing features. He had a very flat face with a tiny high set nose. He was gold and white with black tips and a half black mask. He also had a crooked tail…he was born with it….the last inch or so turned at a right angle from the rest of his tail. On February 14 of this year, a show breeder that I had previously emailed contacted me. She told me that she might have what we were looking for. She emailed me a picture. Upon seeing this picture for the first time, I got chills and was overcome with emotion. I think it was the half black mask. Cindy did not have the same reaction as me at first. We both so wanted this little boy to be Stempy reincarnated. The breeder assured me that this was going to be a little boy. 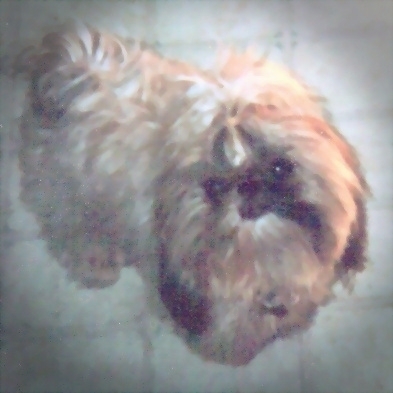 Not that we would not love a full size Shih Tzu (Renay, our 7 year old and Stempy’s best bud, weighs 12 lbs), it is just that we both think Stempy will be tiny again…it was just who he was. We still held out hope that this little boy would be small and be Stempy reincarnated. We named him Tempy (O Tempy Be Stempy). He was born 1/4/06. When we picked him up at 9 weeks, his tail started wagging. He does not have a crooked tail. We hoped for a long time that this was Stempy reincarnated. Tempy has grown quite a bit. At now not quite 9 months old, he is already Renay’s size. He is going to be a big boy. Tempy likes to go outside and play in the grass. Stempy would seldom get off the porch and hated the grass. Stempy insisted on riding on my shoulder in the car. Tempy has never once thought about it and now he is too big to ride up there. Tempy is a little lover. He is very sweet and we love him, just like we love Ditto. Tempy is also related to Stempy, first cousins 4 times removed. We have now also come to the conclusion that Tempy is not Stempy. 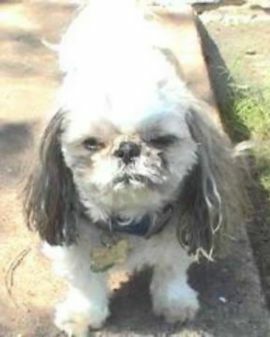 On occasion, I still look at the thousands of Shih Tzu on puppyfind.com. If Stempy comes back, we don’t want to miss him. It has almost become an obsession for me to find him reincarnated, if that’s possible. Maybe because I was always such a skeptic about spirits and reincarnation before Stempy died, I am having trouble knowing if he’s there. He has not shown himself to me or Cindy that I know of. He did appear in a dream of mine for the first time a week or so ago. I dreamed that he had been missing for several months and we finally found him in a shelter. We were soooooooo happy to see each other. Stempy loved Cindy a lot as well, but he was definitely Daddy’s little boy. I have taken his loss extremely hard. 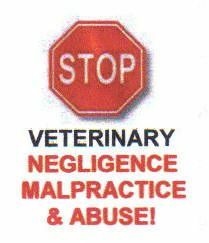 I worked countless hours preparing his complaint, only to see it dismissed twice….in the face of tons of evidence proving the vet’s negligence. We are still trying to figure out our next battle on that front. So far, there has been no justice for Stempy’s preventable death. Stempy is so desperately missed. I firmly believe it was not his time to go….his mission not yet complete. Someday, someway…. Why oh why, can't I? Copyright © 2006 - 2017. Greg and Cindy Munson. FOR STEMPY. All Rights Reserved.